The popularity of The Wizard of Oz was stronger than ever in the 1960s. L. Frank Baum's 1900 children's novel The Wonderful Wizard of Oz and its sequels had been adapted for the screen several times during film's silent era, while director Victor Fleming's wildly colorful version of the original story in 1939, under its famous title, set an insurmountably high bar for subsequent filmed sequels to try and live up to. The music by Harold Arlen and E.Y. Harburg was a big reason why; Judy Garland's barnyard performance of "Over the Rainbow" locked up the Best Song award at the 1940 Oscars and a remake by Bronx-based vocal group The Demensions was a hit in 1960, shortly after a yearly tradition of special television broadcasts of the film began that triumphed in the ratings for decades. Chances ran high that another song from this soundtrack millions of children had memorized would be contemporized for top 40 airplay; the inevitable happened in the summer of 1967 with a pop-rock/baroque take on "Ding, Dong! The Witch is Dead" (celebrating the house-drop demise of the Wicked Witch of the East that irritated her evil Western sister...the one who had all those scary flying monkeys at her beck and call)! The "Ding, Dong!" moment came for a band from Stamford, Connecticut, The Fifth Estate, who'd formed about four years earlier. Wayne Wadhams, 17 at the time the British Invasion began gearing up, was a science geek who played pipe organ at a movie house (a nearly-extinct vocation in '64); keyboards were his specialty. Don Askew was interested in beat-generation writers and poets and lived on a musical diet of jazz and folk music, at least until The Beatles came along. Rick Engler had played guitar for surf-rock group The Galaxies (one of several with that name around the country, this outfit being one of the shorter-lived). Rick's friend Doug Ferrara played bass and guitarist Bill Shute had been pals with Askew since elementary school, circa '58. Jazz drummer Ken Evans was enthralled by sticksman Paul Desmond and the uncommon time signatures embraced by the Dave Brubeck Quartet. They figured The Demen was a clever name and before long the five (minus Don, who opted to write songs for the band while manning the sidelines) found themselves gigging at the Paradise Bar and Grill, a popular Italian place near Wayne's house. Kevin Gavin, a jingle singer from New York City, spotted the group and became their manager, getting them into a studio to make some demos, which led to a quick signing with United Artists Records. The label's A&R men had reservations about the name and respelled it The "D"-Men, suggesting each member take on a name that would fit; Wayne became Dwayne, Rick picked his brother's name Don and Doug chose Duke as each got more unusual: "D. Wm." for Bill and "D'Arcy" for Ken. The first single appeared in late 1964 on UA's Veep imprint; "Just Don't Care," a cross between American and British rock styles produced by Phil Ramone, got some early support from Murray the K at WINS in N.Y. but disappeared within weeks. The quotes in the name had been deleted by the time The D-Men's second 45 hit the streets. They performed their quirky organ-guitar eruption, "Just Don't Care" (another of what would be many Wadhams-Askew-penned songs), on the March 30, 1965 episode of NBC's Hullabaloo, hosted that week by Michael Landon (one of the stars of television's number one series, Bonanza), as the group's hopes ran high that the exposure would net them a hit on the second try. What it did soon after was incite a small-scale riot at a junior high in hometown Stamford; after the show, teenage girls gave chase and tried to tear their clothes off, giving them a rough idea of what the Beatles had been going through. Not surprisingly, they were referred to locally as "The Fantabulous Fivesome," a feeble reference to the Beatles' overused "Fab Four" pet name. United Artists dropped the act, but Gavin arranged for a third single on Kapp, the more intense (or less fun, depending on your perspective) "So Little Time." When it didn't fly, a minor overhaul took place: the band changed its name to The Fifth Estate (citing "fourth estate," a political term dating to the French Revolution of the late 18th century, as inspiration), patting themselves on the back until people started jokingly referring to them as "the fifth mistake." A new member joined, singer Chuck LeGros, who never quite fit in and departed after about a year. "Love is All a Game," a bit more art-rock in execution, was the first official Fifth Estate single in the spring of 1966, appearing on Jerry Leiber and Mike Stoller's Red Bird label, which had a strong track record since '64 but was unfortunately in the first-gasp phase of its death throes that would terminate in the fall, giving the single far less of a shot at success. Kevin Gavin, well aware of Wayne's and Don's effortless ability to write catchy songs, found takers for some, the best perhaps a tune they crafted for folk group The Highwaymen, "My Foolish Pride." The immodest-but-monetarily-challenged lads made some extra pocket change singing on TV commercials while bristling at the lameness of the jingles in comparison to their own compositions. Meanwhile, they spent several months working a frenzied nightclub schedule in New York City. Gavin soon moved on to more upscale pursuits, a development that might have meant the Estate's demise, but a lucky break came when they casually performed the Wizard of Oz tune "Ding, Dong! The Witch is Dead" for independent promoter Morty Wax, who arranged a deal for them with Jubilee Records. Working with sibling producers Bill and Steve Jerome, they reconfigured the '...gone where the goblins go...' tune, interpolating the "La Bourée" movement from German-born baroque composer Michael Praetorius's extensive 1612 musical project "Terpsichore." The 355-year-old, uncredited instrumental portion of their Oz/"Witch" medley took up 45 seconds of the two-minute track...and significantly improved it, by my reckoning. 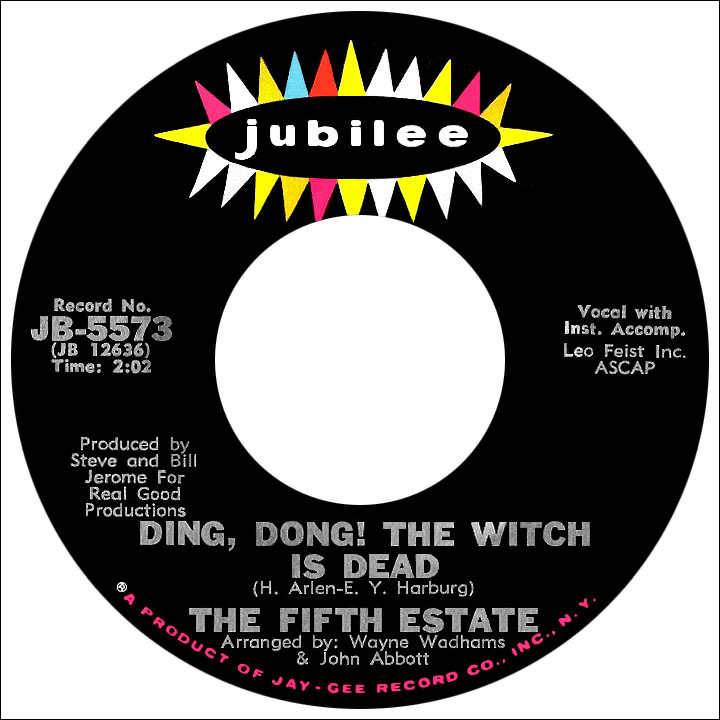 The mashing of the two musical pieces may be the subliminal ingredient to which it owes its success; the Fifth Estate had a hit at last, which spent several weeks in the top 20 during June and July 1967. A failed follow-up, "Goofin Song," aped the Paul Simon/Harpers Bizarre "Feelin' Groovy" mood, after which the guys gave in to pressure from Jubilee brass to apply the classic movie slant that had given them a hit...and out came "Heigh-Ho," the '...off to work we go' singalong by film composers Frank Churchill and Larry Morey from Walt Disney's animated feature Snow White and the Seven Dwarfs that had been a huge hit on Victor for the Dwarves themselves (or at least the singers who voiced them) in the spring of 1938. But again the song had a different feel after Wadhams and company applied the previous formula, blending in parts of Johann Sebastian Bach's "French Suite Number Two." This one received a smattering of national airplay, but didn't make much of a dent in the charts. 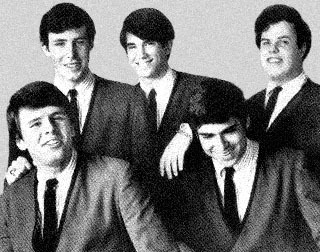 After a return to the more rocking sound with an original, "Morning, Morning," a briefly-charting Alan Gordon-Gary Bonner song, "Do Drop Inn," and Jubilee sort-of swan song "Coney Island Sally," members began the pedestrian process of enrolling in college. They figured they could pick up where they left off later, but the momentum had been lost. Wadhams and Doug Ferrara played on a single by the band Medicine Mike and all the guys stood by, incensed, while Jubilee released two more Fifth Estate singles, "The Mickey Mouse Club March" and "Parade of the Wooden Soldiers," both weak attempts at recycling the children's-movie-style gimmickry of "Ding, Dong!" using hired studio musicians. Turned out this was the end for Jubilee, which closed up shop shortly afterwards and sold their master recordings to Roulette Records. It was also the end for the band...or what amounted to a very long hiatus. About 40 years later, Engler, Evans, Ferrara and Shute regrouped (sadly, Wadhams had passed away) and performed together for several years.